The Smash Vault is where I shall celebrating the games that have acted as the inspiration for the Nintendo crossover fighting series Super Smash Bros. with commentary on the games themselves alongside pieces of fiction to really have some fun. Currently I’m looking at the origins of the Universes introduced in the original N64 title. Welcome to the Smash Vault, where I shall be looking into the games that have inspired the tremendously successful fighting series Super Smash Bros. And where better to start than the 1981 Arcade classic Donkey Kong, the origin of both the Mario and Donkey Kong universes and the game that began Nintendo’s role as a serious gaming developer for decades to come. The premise of Donkey Kong is quite simple, a giant gorilla has taken hostage Lady and it is up to Jumpman to climb up a construction site in order to save her. There are four stages to conquer each representing how far Jumpman has climbed up the site, 25m up to 100m where the climactic battle takes place and Donkey Kong falls to his demise, or at least to one cracking headache. The game then loops back to the beginning with increased speed and enemy frequency, making the true challenge of the game attaining those higher scores. It is very much an Arcade classic which I’m sure almost every gamer today has had some experience with in their lifetime. He’s quite expressive even being so simple! The game’s ascetic design deserves mention too, for at the time of release not many of Arcade units contained the narrative finesse that Donkey Kong brought to the table. Lady (later named Pauline) cries help as she waits for Jumpman (now Mario) to save her. Donkey Kong taunts you as you try to climb and will beat his chest in irritation when you arrive at the top meaning he must advance also. 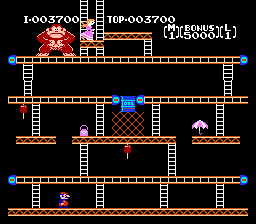 The game also begins and ends with short cut scenes showing Donkey Kong melding the girders into the layout of the first level and the gorilla tumbling down in defeat as Jumpman and Lady reunite. The most noteworthy design however is the creation of Jumpman, whose entire appearance was largely dictated by the graphical limitations that Nintendo were faced with. A hat was worn because hair was difficult to animate, overalls so we could distinguish his arms between his body, and a moustache to cover up that mouth of his. A happy conclusion really, now Mario has become so iconic to the industry. The gameplay today still holds up surprisingly well as long as one approaches it as the Arcade classic it was intended to be. Beating one’s high score is incentive enough to repeat the process all over again but the NES version does provide a Game A and Game B to play around with as well as a 2-player mode for each. As far as I can tell Game B is a more difficult version of Game A but I’m not sure if there’s anything else to differentiate the two. What the standard NES version does lack however (which is retained in the special 3DS edition) is the 50m stage which, while without it the game feel less than complete, does avoid one of the more luck based stages in the game. The sliding cement trays are so close to the ladders ending the stage that you can feel cheated when one or three of them shoot out off-screen at you when you’ve made a leap of faith to actually reach the goal. Otherwise the enemy fireballs and barrels are a nice mix of intelligent and random giving the game that edge of addictive chaos that has grounded it as a classic to remember well into its 30 year life. The game also adds Hammer power-ups giving Jumpman the chance to fight back and Lady’s Parasol and Handbag as collectibles for extra points. While the NES version I still inferior to the original Arcade classic the game remains a delight to play and works tremendously well on the 3DS handheld as something to simply pick up and play at any time. I played the NES version of the game but if you’d like to see how the original Japanese Arcade version plays check this video out. November 25, 2014 September 26, 2016 p4ratchetArcade, Donkey Kong, Mario, NES, Nintendo, Smash Vault Articles, Super Mario, Super Smash Bros.